This unit contains five lessons that center on politics and diplomacy. The main goals of the unit are that students understand the arts and skills of diplomacy and become aware of some tools used by successful diplomats. 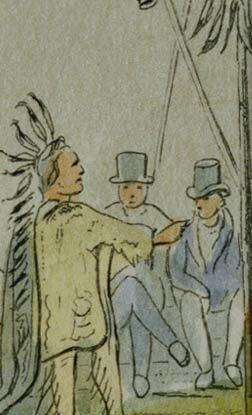 The content focuses on rich descriptions of meetings between Lewis and Clark and Indian tribes, especially the Teton Sioux and the Shoshone. These encounters offer fertile fields for students to begin understanding the arts and skills needed for successful diplomacy. The unit includes the examination of both American and tribal values/goals. It also explores diplomatic strategies and how Lewis and Clark used these strategies both successfully and unsuccessfully. The pedagogy of the unit is based largely upon inquiry. Relying heavily on the use of primary documents, artifacts, paintings, a map, and a time line, students gather and analyze information, compare and contrast cultures and points of view, make inferences, and write about their discoveries. Ongoing student assessments are both formative and summative. Assessments take the form of oral recitation, written summaries, and completion of graphic organizers to show understandings. A Performance Assessment Task, in which students apply learned knowledge and skills of diplomacy in a scenario of conflict between two school teams, is included as a culmination of the unit. Explore Connections to Today for this unit. Successful diplomacy depends in large measure upon the negotiating parties having a deep understanding of each other's goals and values. What makes a diplomat successful? How does understanding the other's cultural values and goals lead to success in diplomacy? How can misunderstanding the other's values and goals lead to diplomatic mistakes? know the key events/outcomes of these two encounters. Students will take the role of a diplomat, Meriwether Lewis, and write a three-to-five-sentence speech to be read to a tribal chief. The speech must incorporate at least three of President Jefferson's diplomatic goals. Students will take the role of a tribal chief and write a three-to-five-sentence response to the above speech. The response must include at least one reason to accept or reject what Lewis has written. Students will list (or draw and label) the four major diplomatic strategies used by Lewis and Clark and give an example of each. Students will sequence four encounters on a time line and infer the degree of diplomatic success for each encounter after analyzing primary sources. Students will write a four-to-five-sentence summary of the encounter between Lewis and Clark and the Teton Sioux, including at least three of their new vocabulary words, correctly used. Students will tell the story of Lewis and Clark's encounter with the Shoshone tribe orally to another student. The recitation must include at least three details from the narrative they have heard. Students will complete a Venn diagram to compare and contrast the Corps' encounters with the Teton-Sioux and the Shoshone tribes. Students will use an information chart to compare various perspectives of the pipe ceremony.